In 2011, Peel Living representatives approached the IwB for consultation long term use of land of the Twin Pines mobile home community. 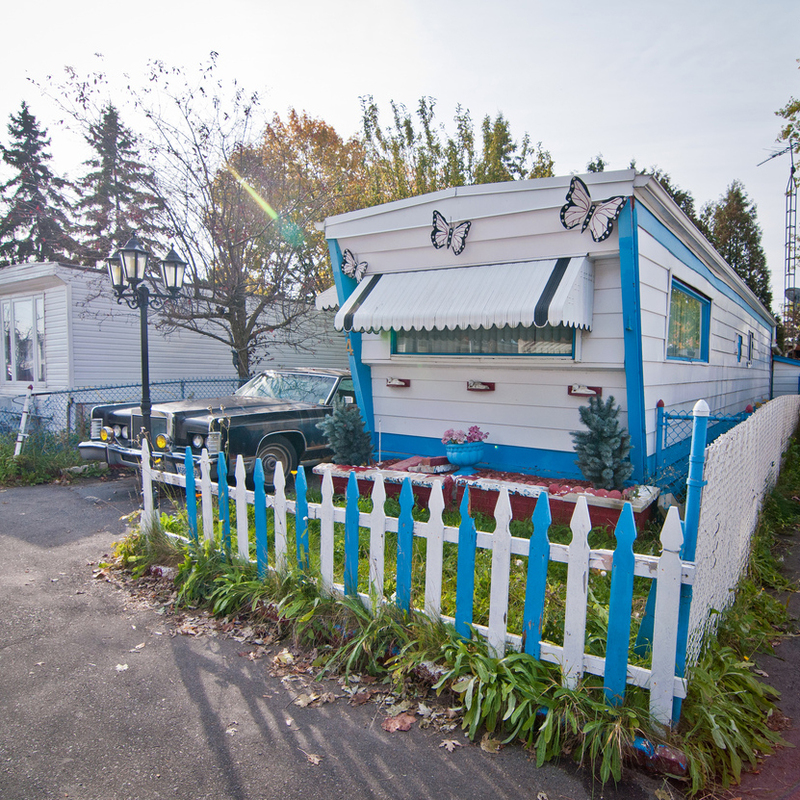 The trailer park has been located in south Mississauga for several decades with many long term tenants, but starting in 1996 the future of the park was in questions as pressures for private development of the area increased. In 1996, due to resident advocacy, Peel Living became the new landlord of the Twin Pines property and a 20 year lease agreement was signed. More recently, Peel Living began to explore options for the future of the Twin Pines Community beyond 2016, when the current land agreements will expire. 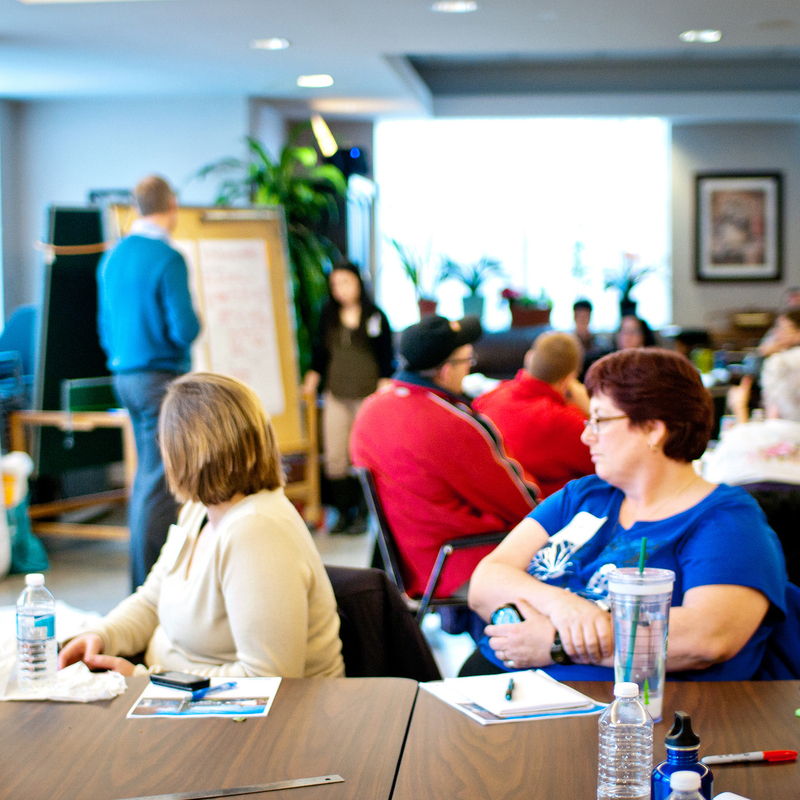 To this end, between February and April 2012, the IwB conducted a multi-step charrette process including a town hall session, two community charrettes and a professional charrette, resulting in a Report of Recommendations for Twin Pines that looks at ways to preserve the interests of the residents as well address the significant need for affordable housing in the Region of Peel. The aims of the Twin Pines charrette consulting process was to generate options for the highest and best use of the land at Twin Pines to be presented to the Board of Peel Living. Designs had to stress innovative long term planning solutions that balance current issues facing the community such as increasing land values, aging population, and decaying site infrastructure. Each concept had to consider the triple bottom line, taking into account the environmental, social, and financial factors facing the community. When the Pallet family transformed their apple orchard into a mobile home park, they would have never imagined the community that would develop permanently on their property. The Twin Pines Mobile Home Park dates back to 1949, when the first mobile homes were established on the Pallet family’s apple orchard. The park was originally called Cedar Grove, it was expanded during the installation of the nearby Trans-Canada pipeline for workers who needed affordable housing close by to the work sites. The park continued to expand in the decades following and into the 1990s. The tenants owned their mobile homes and paid rent to the Pallet family. In the early 1990’s, as the City of Mississauga had considerably expanded around the site, the Pallet family began to get offers from private developers to sell the land and create condos within the park boundaries. The Pallet family decided to sell the land, which meant that the residents of Twin Pines were facing mass eviction. The residents organized and protested the decision, blocking the transaction through a series of legal and public relation strategies. As a result, Twin Pines was purchased by Peel Living in 1996 (a social housing Corporation owned by the Region of Peel) to keep the area as an affordable housing community. By purchasing the land, Peel Living as a non-profit housing provider, added to its affordable housing portfolio and became the landlord of the property. The existing mobile homeowners and Peel Living decided upon an agreement that provided security of tenure to the original tenants for a period of 20 years (it is due to expire in 2016). Since then, the park has thrived and the residents have added to its appeal as a sustainable neighbourhood with a strong sense of community. Twin Pines has also expanded with the addition of the Summerville Pines Community built on the same parcel of land next to Twin Pines, and the addition of the Peel Family Shelter that provides much needed emergency assistance to families without housing. Twin Pines, Summerville Pines, and Peel Family Shelter are an example of three different types of housing solutions (home ownership, rental housing, shelter housing) to help meet the need for affordable housing and safe shelter in the Region of Peel. Even though the community has thrived, its future remains uncertain. More recently, there have been talks about extending the security of tenure agreement to 2030. The Peel Living Board has reached out to the IwB to inform future decisions for Twin Pines. Through the multi-step charrette process, the IwB was able to propose a Plan of Action that considered the best interests of the residents of this community and the future of the neighbourhood within the context of a changing Mississauga. The Town Hall Session in February 2012 brought together nearly 200 residents and the two charrettes following ensured that the consulting process was as transparent and accessible as possible. The town hall and the community charrettes gathered direct information from the residents about their needs and wishes, giving them a venue to share their own ideas about the future of their community, and most importantly, engaging the residents in the process so they felt a sense of ownership over the solutions that were presented to the Board of Peel Living. Considerations for the consultation process included taking into account: the needs and fears of the residents; Peel Living’s affordable housing mandate; entitlement rights of mobile home tenants; displacement of elderly people with low income; issues around personal accrual of value on what is now public land; 44 year rights (Force Majeure issue), etc. 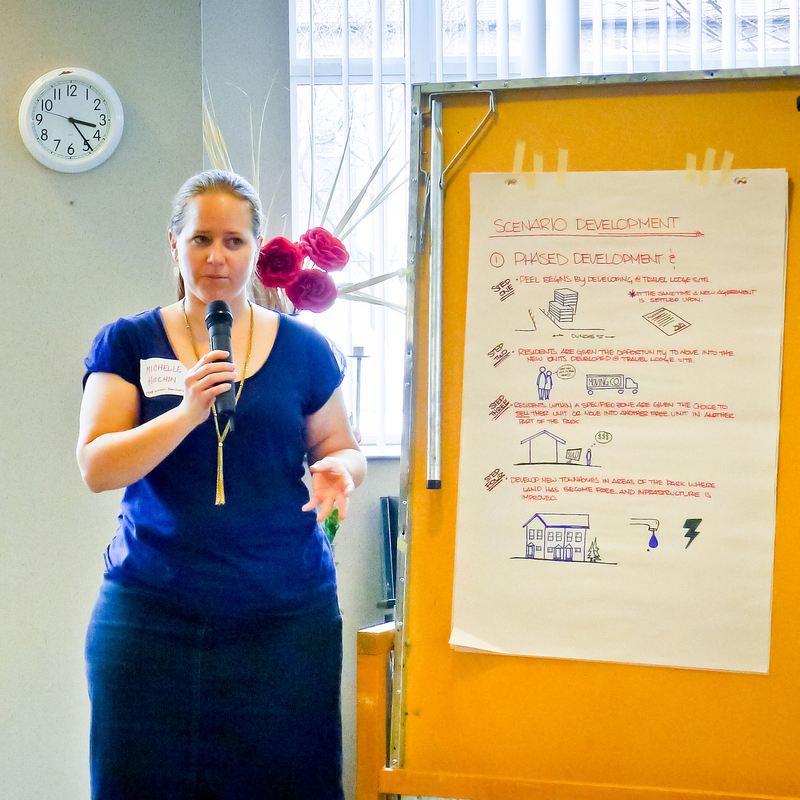 Following these events, in April 2012 a professional charrette was held to build on the information and concepts gathered. Experts worked together with advisors from the City of Mississauga to generate further ideas and develop and evaluate concepts, narrowing the choices down to a few feasible yet innovative long term planning scenarios. The July 2012 Report of Recommendations produced by the IwB incorporates refined and developed scenarios based on the work from the community and professional charrettes. The ideas discussed and developed include: plans for phased redevelopment, profit sharing and new financial propositions so that private speculation on public land would stop, density transfer, grandfathering with infill, corridor development and many other ideas. The report stresses new and innovative improvements for the Twin Pines Community. For more information view the July 2012 Twin Pines Report of Recommendations.